Pop-up ads are some of the more common annoyances cited by many Internet users. These ads create new browser windows which appear on top of what you're currently trying to read. Fortunately, it's fairly simple to keep them from interfering with your online experience. Most of the top web browser programs available today come with a built-in option to block pop-up ads and pop-up windows. If the setting has not been already activated by default, it is easy enough to enable the feature manually. These instructions apply to most desktop and laptop computers as well as tablets that run full versions of desktop operating systems like Windows 10. Pop-ups are blocked automatically by default in Google Chrome. Blocked windows are indicated by an icon in the address bar and clicking on that icon reveals options to view the pop-up if desired. Click on the menu button (three horizontal lines) in the top-right corner. Click on "Show advanced settings" near the bottom. Scroll to the "Privacy" section. Click on the "Content settings" button. Scroll down to the "Pop-ups" section. Choose to allow or to disallow sites to show pop-ups. Chrome also offers additional options, like blocking or allowing pop-ups for a specific website, and these options can also be configured through the same settings menu. Many privacy settings are integrated in Microsoft's Internet Explorer program. Among these is the built-in pop-up blocker. Start the Internet Explorer program on your computer. Click on the "Tools" button, which appears as a gear icon. Select "Internet options" from the resulting menu. Navigate to the "Privacy" tab. Tick the box marked "Turn on Pop-up Blocker." Click "OK" to confirm your new settings. When a pop-up window is blocked in Mozilla Firefox, a new bar appears below the address bar indicating which pop-up windows have been prevented from opening. The Options button provides choices for how to handle these pop-ups. Accessing the settings for the built-in pop-up blocker is similarly straightforward. Click on the "Options" button. Choose "Content" from the resulting menu on the left. Ensure the check box marked "Blocked pop-up windows" is checked. Click on the "Exceptions" box to the right to white-list sites where pop-ups may be allowed. Unlike some pop-up blockers that will block all pop-ups from appearing at all, the pop-up blocking feature in Safari 9 (which shipped with OS X El Capitan starting in 2015) will only block pop-up windows which appear when you open or close a page. It will not block pop-ups that appear when you click a link. 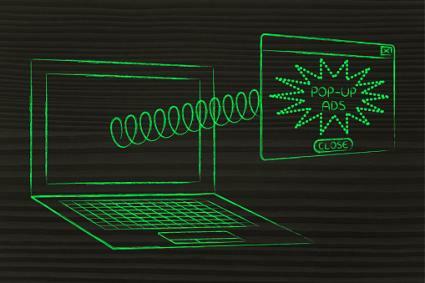 To enable the pop-up blocker, follow these simple steps. Click on the Safari menu located at the top of the screen. Choose "Preferences" from the drop-down menu. Navigate to the "Security" tab from the resulting settings menu. Check the box marked "Block pop-up windows." De-select the fields marked "Allow WebGL" and "Allow Plug-ins." Apple iPhone and Google Android devices come with pop-up blocker features in their respective mobile web browsers. The default browser on the iPhone and iPad is an iOS-optimized version of Safari. The pop-up blocker is accessed through the settings menu. Launch the "Settings" app on the iOS device. Choose Safari from the resulting list. Look under the "General" section. Toggle the "Block Pop-ups" option to enable or disable the pop-up blocker. Most Google Android smartphones come with the Google Chrome web browser for mobile devices. Blocking pop-ups is enabled by default. Tap the three dots to access the menu. Tap on "Site Settings" underneath the "Advanced" section. Select "Pop-ups" from the resulting list. Toggle to decide whether pop-ups should be blocked or allowed. For the purpose of preventing unwanted pop-up windows from appearing, the blocking features built into the mainstream web browser programs listed above are generally sufficient. However, some users may desire additional functionality or customization, such as the ability to block other advertisements. Poper Blocker: Available as a free Chrome extension, Poper Blocker will block all pop-ups and pop-unders. Thousands of reviews through the Chrome Web Store are overwhelmingly positive about the effectiveness of this extension although some users say it is not as effective as it once was since websites have started to implement workarounds. Ad Muncher: Previously selling for about $30 plus a $20 annual fee, this ad-blocking program is now completely free. It works with all browsers and will block pop-ups as well as other "nasties on the net," like scripts that try to install spyware or track your browsing habits. Since the developer started offering Ad Muncher for free in 2014, updates appear to have been nonexistent. AdBlock: One of the most popular ad-blocking solutions for a variety of platforms, AdBlock can be used to block a wide array of web advertisements. Most ads are never downloaded to begin with which results in a faster web browsing experience. It is offered on a "pay what you want" model with a minimum price of $5, and extensions are available for Chrome and Safari. While the widespread perception of pop-up windows is that they are intrusive and annoying, not all pop-up windows are advertisements. Some may be required, such as a window that pops up and requests login credentials. Government and corporate websites may also use pop-ups to deliver official forms to be filled. While pop-up blockers may certainly be useful, it's still important to check whether a blocked window is actually unwanted.